This big 8 x 8 size can be easily cut with scissors to fit most any size spa! Blanket floats on water underneath regular spa cover to keep heat in. Provides maximum heat retention. A must for outdoor spas in the winter ! Great for indoor spas too ! 8 x 8 Deluxe Blanket (above) is blue chemical resistant vinyl on one side and black chemical resistant vinyl on the other side with approx. 1/4" foam in between. Simply cut the blanket with a scissor to the shape of your spa and allow it to lay flat on the water surface. "Hot Tub Thermal Blankets Save You Money !" With the increased price of oil and the ridiculously high electric rates we pay, anything that you can do to reduce your household energy consumption is important. Since wintertime use of a hot tub tends to increase your energy bills, it is imperative that you create the most energy efficient and insulated environment for your hot tub water. One of the best ways to do this is with the use of a hot tub "Thermal Blanket". 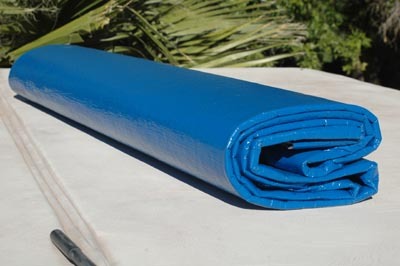 Basically, the concept is this...a floating foam blanket is cut to the exact shape of your hot tub water surface. 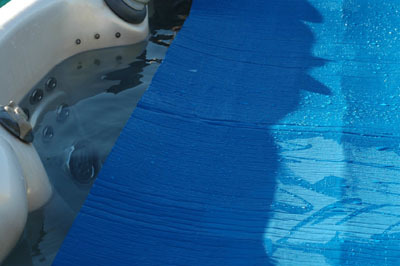 This blanket floats on the water surface underneath your regular hard thermal cover. When you use the two covers in conjunction with each other, they provide the maximum degree of heat retention possible in a hot tub. The hard cover keeps the cold air out, and the Thermal Blanket keeps the heat in the water ! Please note: This item cannot be shipped out of the 48 Contiguous United States.